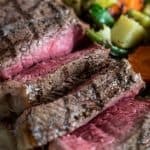 Cook a steakhouse steak at home with this easy and simple recipe! No need for a grill, this steak is made indoors. Heat a seasoned cast iron skillet to high heat. Combine salt and pepper on a plate. Meanwhile, pat steak dry with a paper towel. Brush all sides with olive oil and press steak into salt and pepper on all sides to coat. Once skillet is extremely hot, sear steaks on all sides until brown, about two minutes per side. Be sure to get all sides to lock in that juiciness! Remove steaks from skillet and either move to baking sheet or leave on cast iron. Top with pats of butter and place into preheated oven. Bake for 5-10 minutes depending on the thickness of the steak and your preferred level of doneness. Check steak temperature to determine when it is done. For rare steak cook until 120 degrees, 125 for medium-rare, and 135 for medium. Remove steaks from oven and allow to rest for five to ten minutes before serving. The high heat from cast iron skillet may cause some smoking of the pan, be sure to use your fan and ventilate your kitchen during this step.